Current solar cell designs need to be aimed directly at the sun to be most efficient. 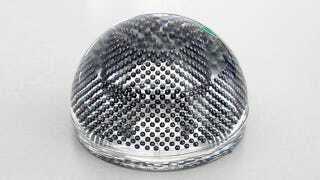 But a Japanese company has come up with a clever new approach using spherical micro cells that can harness the sun's rays from any direction. The flat solar cells we typically see dotting roofs and filling fields only really work at optimal efficiency for part of the day, when they're staring directly at the sun. Unless they're mounted to motorized tracking systems, which of course gobble up some of the energy the cells are producing. But Kyosemi's Sphelar cells use an array of tiny spheres that collect the sun's rays no matter where they're coming from.